Police block off Spring Garden Street at the Community College of Philadelphia as authorities search Tuesday morning for a man with a gun. 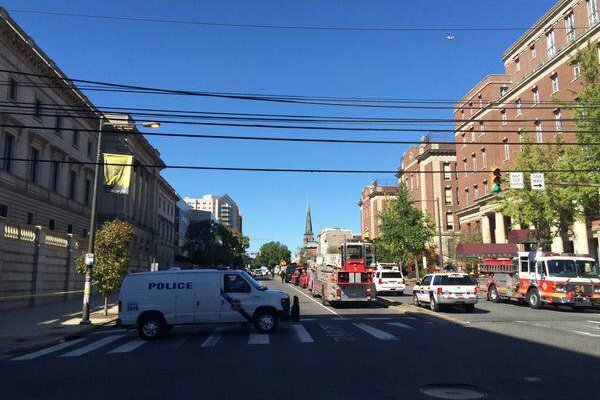 Philadelphia police announced Wednesday that there will be no charges filed in connection to the lockdown at Community College of Philadelphia on Tuesday morning. Classes resumed Wednesday at Community College of Philadelphia, where college president Dr. Donald Guy Generals announced that the former student who had been detained by police was released, citing a lack of evidence for the prosecutor to press charges. There was no weapon found on the campus following a search with K-9 units. Dr. Guy Generals also announced that beginning Monday, students at CCP will have to both present their IDs and swipe them in order to gain access to buildings. The announcement follows several days of heightened security at schools throughout the Philadelphia area, including another lockdown Wednesday morning at Martin Luther King High School in West Oak Lane. Police received a tip that a student might be in possession of a stolen handgun, which was believed to have been passed among several teens at the school. A juvenile suspect was arrested later on Wednesday at SEPTA's Fern Rock Transportation Center. Officials said he was enrolled to attend MLK High School, but had not attended class during the current school year.